Chesterton portrays Father Brown as a short, stumpy Roman Catholic priest, with shapeless clothes and a large umbrella, and an uncanny insight into human evil. &quot;How in Tartarus,&quot; cried Flambeau, &quot;did you ever hear of the spiked bracelet?&quot; -- &quot;Oh, one&#39;s little flock, you know!&quot; said Father Brown, arching his eyebrows rather blankly. &quot;When I was a curate in Hartlepool, there were three of them with spiked bracelets.&quot;&nbsp;Not long after he published Orthodoxy, G. K. Chesterton moved from London to Beaconsfield, and met Father O&#39;Connor. O&#39;Connor had a shrewd insight to the darker side of man&#39;s nature and a mild appearance to go with it--and together those came together to become Chesterton&#39;s unassuming Father Brown. Chesterton loved the character, and the magazines he wrote for loved the stories. The Innocence of Father Brown was the first collection of them, and it&#39;s a great lot of fun. The Man Who Was Thursday: A Nightmare is a novel by G. K. Chesterton, first published in 1908. The book is sometimes referred to as a metaphysical thriller. Orthodoxy (1908) is a book by G. K. Chesterton that has become a classic of Christian apologetics. Chesterton considered this book a companion to his other work, Heretics, writing it expressly in response to G.S. Street&#39;s criticism of the earlier work, &quot;that he was not going to bother about his theology until I had really stated mine&quot;. 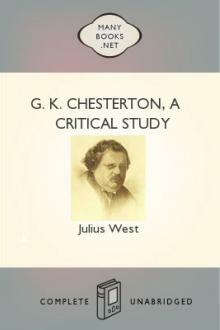 In the book&#39;s preface Chesterton states the purpose is to &quot;attempt an explanation, not of whether the Christian faith can be believed, but of how he personally has come to believe it.&quot; In it, Chesterton presents an original view of Christian religion. He sees it as the answer to natural human needs, the &quot;answer to a riddle&quot; in his own words, and not simply as an arbitrary truth received from somewhere outside the boundaries of human experience.